When lucky bamboo is too tall, it's necessary to cut back the sprouts grow too tall and dying leaves. 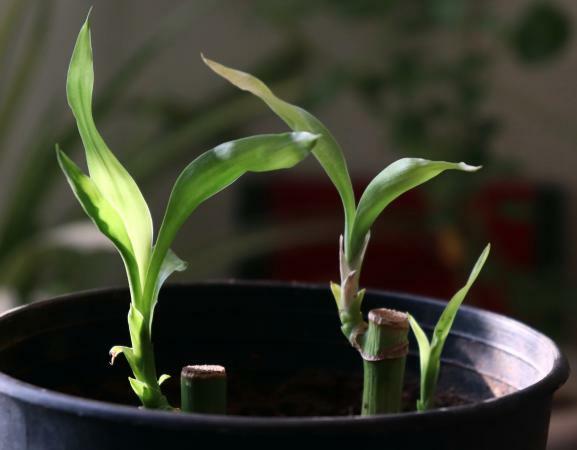 Knowing how to trim lucky bamboo or cutting a lucky bamboo stalk in half to propagate it from the trimmings is a valuable skill if you have these plants in your home or office. Lucky bamboo (Dracaena sanderiana) is a versatile plant that can grow either in water or soil. Can you prune lucky bamboo? 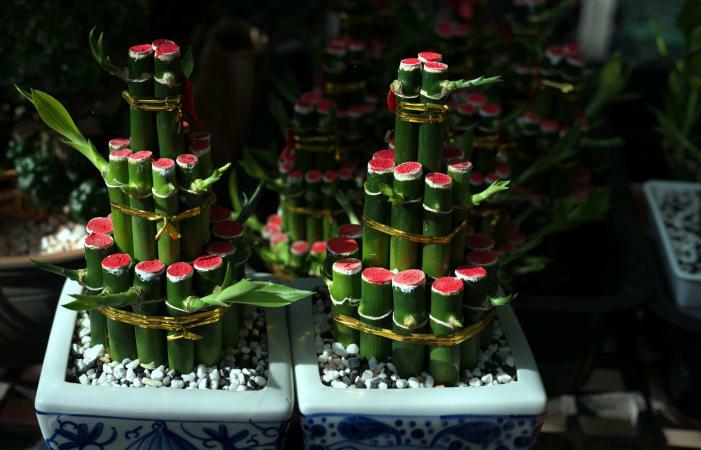 Not only can you cut a lucky bamboo plant, but if the plant grows too tall, it is necessary. Trim it without worry over stunting its growth since it's a hardy plant, and pruning makes it grow faster. You don't need many tools - just a pair of very sharp pruning shears or scissors. Be sure your scissors or pruning shears are sharp. You want the cuts to your plant to be clean, not jagged. Ragged cuts and tears present opportunities for unwanted bacteria and disease to enter into the healthy plant shaft. The size of the bamboo shafts in your arrangement won't change, but the height of your arrangement grows as new sprouts emerge from the stalks. Don't trim the bamboo stalks unless you wish to change the height of your arrangement. Once you've pruned a stalk, it remains the trimmed height since the bamboo stopped growing as soon as it was harvested for your arrangement. The sprouts (leaves) are the only part of your arrangement that continues to grow after harvesting and eventually need trimming. If you wish to shorten the length of the stalks, cut them and then propagate the cut halves in water or soil to create another arrangement. New sprouts will grow from the cut stalks and soon you'll have another arrangement. Be sure to keep the leaves out of water since the leaves will rot if left soaking in water. It's always best to trim less than what you've planned to ensure you don't over prune your arrangement. You can always trim more if necessary. Start trimming around the bottom of the plant and work your way up toward the top. Trimming encourages new growth and is necessary as your plant ages. The sprouts continue to grow while the stalk remains the same height and thickness. This can cause arrangements to eventually become top heavy and necessitates a trim. If it's your intention to root the cuttings, snip the sprouts about one or two inches away from the main stem just below the node. The node is where the sprout first emerged from the shaft. This is the area where new roots will form and soon give you a new plant. That's why it's important that you cut the sprout so the entire node stays intact with the cutting. Some people insist you must cut a sprout at an angle in order for it to root. This isn't true. You can cut the sprout either straight or at an angle and still have a good root system grow from the cut. Leave a one to two inch nub on the shaft; this will encourage new leaves to grow from the cut area. Trimming also helps your bamboo grow back fuller than it was before you trimmed it. If you don't want more growth on your plant, then use paraffin to seal the wound left by cutting the sprout off of the shaft. Leaves can die for any number of reasons, so you want to trim these from the sprout. Pruning leaves from the sprout or stem encourages more leaf growth. If you wish your plant to branch out and produce more leaves, then you can selectively trim just the leaves. Cut the leaf away from the sprout or stem. The stem from the sprout may be very long with multiple leaves along the shoot. Make the cut right along the stem at the point where the leaf grows out from it. Be careful not to cut too close to the stem. While you want to remove the yellow/dead leaf, you shouldn't strip it from the stem. Make your cut just below the yellow or dead part of the leaf, leaving the remaining green part growing out from the stem or sprout intact. This area will recover quickly and soon you'll have new leaves growing in place of the cut leaf. If the leaf is close to the sprout, then cut at least one inch above the sprout. If you decide you no longer like the way your lucky bamboo arrangement looks, you can make a drastic change by cutting all the sprouts back to the stalk. In this case, you'll want to trim the sprouts flush with the stalk. Because you've trimmed the sprout so close to the stalk, new sprouts might not grow from the trimmed area. If you cut the stalk of your bamboo, there's a risk of bacteria seeping into the cut area. If your bamboo becomes infected, the water will turn murky or brown and have an unpleasant odor. At this point there's very little you can do to save your bamboo and it should be thrown away. Select only choice cuttings to root. Make sure the sprouts you use have at least two leaf points to ensure you have enough of a sprout to root. Trim to the growth node. Place the sprout in either soil or water to allow roots to grow. When the roots start to grow, if propagating in water, add marbles or small stones to stabilize the plant. Care properly for the new lucky bamboo plant. Some people use rooting hormones to encourage fast root systems. If your plant is healthy, you won't need to use this. Cutting lucky bamboo is easy when you follow these instructions and will keep your plants healthy if done on a regular basis.